Our project includes three modules: an input module, a processing module and an output module. In order to realize the principle of our design, we designed two rewirable circuits: a repressilator with lox71 site and lox66 site to achieve the alteration from the state of oscillation to the other state of a stable switch; and another rewirable circuit which is related to quorum sensing to perform the change from positive feedback to negative feedback. 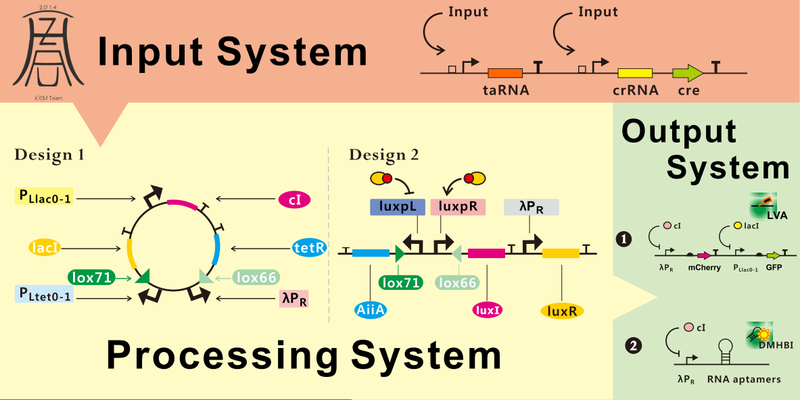 To prevent the leakage of the expression of Cre protein in our input module, we added a riboregulator in front of the coding sequence of Cre protein. As to our output module, we got two devices to detect whether our processing module works or not: one is the fluorescent proteins with Lva tag; the other is the spinach RNA aptamer. Most of our parts are constructed by BioBrick™, but for purpose of meeting the special requirement of our construction that we need to connect some parts reversely, we designed a new way based on the BioBrick™ to assemble those circuits. Furthermore, we have done a lot of work in testing and in the collaboration with other teams. Firstly, we have found the unexpected recombination of lox71 site without Cre protein, and we designed a device(as shown in the Characterization) to verify this phenomenon and finally we tested whether it would affect our results and to what extent. Secondly, we conducted plenty of experiments for all these inducible promoters we used in our gene circuits by microplate reader to get some information about their intensity which help us to select the optimum promoter. Thirdly, to test whether our riboregulator works as expected or not, we replaced the coding sequence of Cre protein with the coding sequence of mCherry protein in the input module to detect the efficiency of this riboregulator by fluorescence intensity. As to the work of collaboration wit other teams, definitely, we did help HUST-China to sequencing their promoters and did this test of promoter intensity. Anyway, the road to success is always laborious, but we still stick to our goal and finally make it by ourselves. To us, we spent a fullest summer holiday in our college lives and even took a big step forward in our life-long career. The following are more details about our experiments.